Illusions, you don't have time for me illusions. The great French comedian Jacques Tati wrote "The Illusionist" in the 1950s for his daughter. There is some dispute over which daughter he wrote it for - his youngest daughter Sophie Tatischeff, or his illegitimate eldest daughter Helga Marie-Jeanne Schiel, who he abandoned after World War II - but in its depiction of the relationship between an old stage magician and a Scottish girl that joins up with him after seeing his act, there is no dispute that the idea came from a place of deep pain for Tati, and he wanted to make amends for having abandoned both his children in pursuit of art and magic. As the film begins, The Great Tatischeff is playing to half-empty music halls in France as dwindling crowds are clearly becoming bored with his old tricks and illusions. After being upstaged by a British band named Billy Boy and The Britoons (who are shown playing a derisively generic brand of rockabilly and mince flamboyantly around backstage, suggesting that Chomet, Tati or both have a dim view of the entertainment that was usurping Tatischeff's style of showmanship) and in desperate need of cash, his agent sends him to England, where he fares pretty much the same. After being accosted by a drunk Scotsman at a wedding where he is otherwise ignored, Tatischeff lands a gig performing in a pub in a town that can only be reached by boat. There he meets a young girl who finds his tricks fascinating instead of boring, and when he leaves for a job in Edinburgh, she tags along. In order to maintain the illusion that his tricks - many of which involve him turning cheap clothes and shoes into more expensive versions - he has to resort to more and more desperate measures, including taking a demeaning job as a performer in the window of a department store. 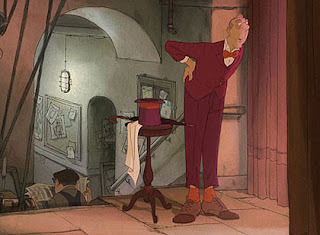 Chomet, in adapting Tati's screenplay, retains the melancholy feeling of such a personal story, and even though he bases the physical appearance of the magician on Tati himself (as illustrated by one scene in the film in which Tatischeff walks into a cinema screening Tati's "Mon Oncle" and sees his creator striking the same pose as his animated self) he gives the film his own distinct feel by using the same gorgeous animation that made his previous film, "The Triplets of Belleville", such a delight. Chomet lovingly captures his Scotland, showing the majesty of the highlands and the beauty of the Edinburgh of the 1950s. It's markedly different in style to "Bellville", which saw its cast of grotesques populating an exaggerated city that amalgamated every possible U.S. city into one nightmarish landscape. Whilst Chomet's Edinburgh is still populated by caricatures - including a team of acrobats who travel solely by performing backflips - the city itself is faithful the geography of its real-life counterpart. At the same time that he relishes the opportunity to pay tribute to the city itself, Chomet is rather unflinching is his depiction of the people that populate it. At one point, Tatischeff takes a job in a garage and, after a gently funny sequence in which he is paid handsomely by an American customer to clean his care, gets the car covered in oil, then leaves it outside overnight in the rain to get clean, he is fired. His ex-boss discovers Tatischeff's money in his old overalls and keeps it. People are there to exploit Tatischeff, a man who just wants to bring joy into peoples' lives, and this gradually causes him to becoming sour and disillusioned with his own profession. If the central struggle of Tatischeff wasn't sad and desperate enough, director Sylvain Chomet shows us several others that complement it. We see a clown who, unable to work, puts on his make-up and attempts to hang himself to upbeat circus movement. Elsewhere, in one of the saddest jokes in the film, a ventriloquist is shown gradually degrading as he first sells his dummy, then becomes a drunk. It's a bittersweet view of the way in which new forms of entertainment steamroll the old, and Chomet and Tati seem to be unequivocal in their rueful sense that just because time passes, that doesn't mean we have to be happy about it. This all seems to suggest that the film is a complete downer, and whilst that's a pretty fair assessment - the last ten minutes are emotionally devastating, and include four of the saddest, most crushing words you'll ever see in a film - there is a lot of humour in it. Chomet gives the slapstick scenes in the film the same grace that Tati's live-action work had, and they are genuinely funny. However, it's a story about time passing, the death of innocence and the way in which a man becomes disillusioned with his own work. It's a deeply sad, beautiful film that borders on the profound, and may very well be a masterpiece. But it won't leave you smiling.